Give men a legitimate excuse to ogle in this two-piece dress in Capri style. Made in dupion silk, this top has a halter neck with spaghetti straps. 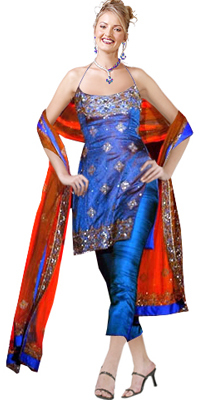 It is embellished with spangle works all over the length with slightly heavier work at the bust and hemline. This artistic handwork is also provided on the complementing shawl to balance its ethereal aura. The dress is also available in other dupion colors.